The Blast has one part time employee, a few key regular volunteers, and many volunteers who have helped out in various capacities. Eventually, we'd like to grow a full staff and be live 24/7 with on air personalities. Colin "Cruz" Strombeck is the founder, program director and president of The Blast Ministries and TheBlast.FM. 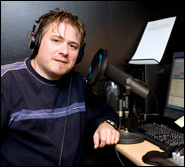 Colin has been in radio since February 1990, with much of that time programming Christian rock radio. Colin founded The Blast Ministries in November 2005 in preparation for the January 1, 2007 Blastoff of TheBlast.FM. Colin’s career highlights include time spent as Program Director, Music Director and Morning Drive Host for KLYT-FM, a Christian rock radio station in Albuquerque, New Mexico. Colin’s Massive Morning Show was nationally syndicated on another Christian radio network in the early 2000’s. Colin was a national seminar speaker at GMA (Gospel Music Association) Week in the 2003 Christian Rock Radio Track, and he has won a couple of national awards in Christian rock radio at GMA Week, also in the early 2000’s. Colin programmed a couple of FM Christian rock shows in Houston and a Houston-based internet radio station in the early-to-mid 2000’s and has been on the air in various cities around the upper Midwest, including a stint with WNCB, during its mid 1990’s heydays when it covered almost the entire Minneapolis/St.Paul metro area. Colin grew up in a Christian church and had an intellectual belief in God, but he never formally gave his life to Jesus Christ as personal Savior and Lord until a DJ shared the Gospel during a Sunday morning Christian pop/rock radio show on a Yankton, South Dakota FM secular top 40 station in the mid 80’s. Colin was then partly inspired to do what he does by an AM Christian pop/rock station called 1520 KJIA/Sioux Falls. Colin then knew of his calling to be used in Christian rock radio to reach young people in 1987, and he has worked in that radio format as much as possible since then. In realizing the need for a more radical format and with many stations opting for the safer approach to music formats, Colin felt that God was calling him to launch a radical youth station. Colin realized that politics of the industry and fears many stations may have of offending donors with heavy Christian music, had suppressed the aggressive format that he was called to. Starting something new was what God had in store. God had taken him through all of the prior stations of life (in radio) to prepare him to start a new radio station whose music would not be subject to softening at the whims of management who did not understand the importance and impact of aggressive, progressive Christian music in the lives of young people. Colin, with much prayer, has assembled a board of directors comprised of people with experience in this radio format and in professional musicianship and pastoring. All of the board directors are intensely committed to The Blast’s mission statement of using aggressive, progressive Christian music internet radio to attract youth and young adults to the message of hope, meaning, purpose, and eternal life found only in Jesus Christ. Interview with The Blast's Colin Cruz posted on www.hisair.net, Click here to read it! God was working on this team up for a long time, Jody and Colin met many years ago while both attending the University of South Dakota. Jody was a frequent listener of Colin's "Holy Rockin' Mosh" program on the college radio station. They both went on their career paths and met again in September of 2007 during the LifeLight music festival. Having experience with web design and development Jody says to Colin, "Dude, your site needs help." Jody has been the official webmaster since then.